Artichoke is a beautiful vegetable. When it’s in full bloom, beautiful purple color tipped leaves open up like flowers. Unfortunately, I don’t have much luck growing artichokes but I saw this beautiful specimen at Stone Barns Center and I wondered how anyone can cut it and eat it. Isn’t it beautiful? It’s an edible flower! Anyway, I can never forget the first time I ate an artichoke. It was when my college roommate brought her mom’s stuffed artichoke after a Christmas break. I remember getting all messy and licking my fingers after demolishing what was once a savory sausage and herbed bread crumb stuffed “green flower.” It was intimidating at first, but then, slowly, I scraped the delicious stuffing from each petal into my mouth and it was fun. 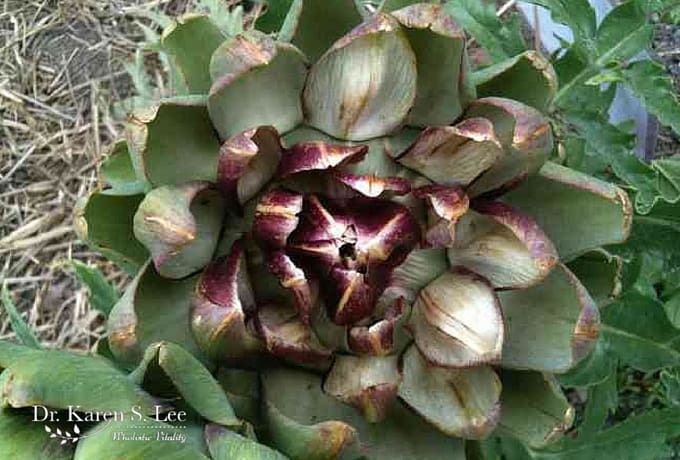 The furry and prickly hairy choke was annoying but once I got through and finally bit into the soft nutty artichoke heart, I was smitten with this interesting vegetable. 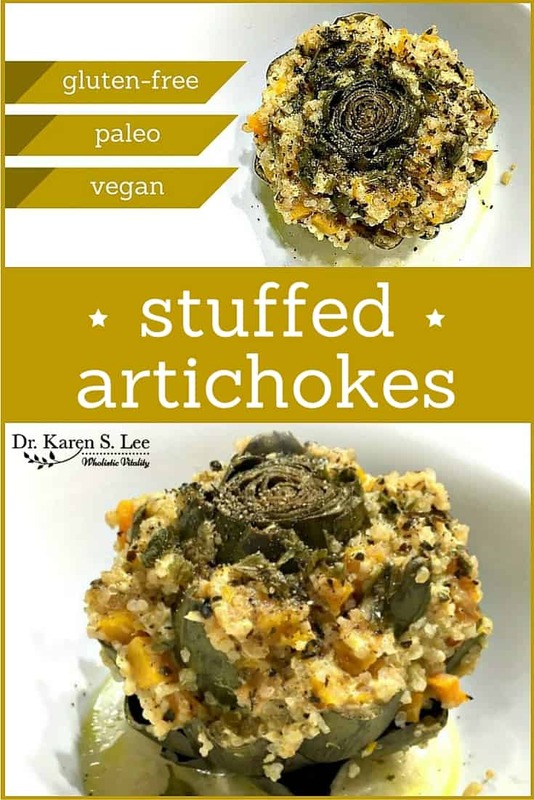 Since then, I started the tradition of making stuffed artichokes during the holidays. You can make the stuffing in any diet style you follow. 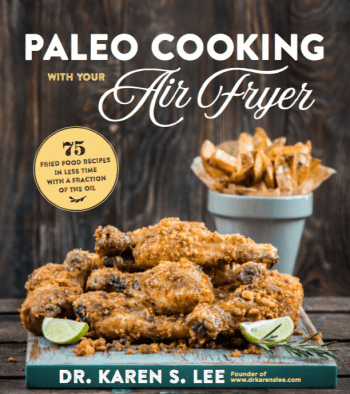 I made this paleo version because we don’t eat bread crumbs anymore. But if you can eat bread, use herbed bread crumbs and mix with Italian sausages, bacon, or pancetta. Or if you want to keep it vegetarian, leave out the meat and use hearty root vegetables like butternut squash or sweet potatoes with bread crumbs. It’s so versatile that you can really get crazy creative. Cut the tips off with sharp kitchen shears, and trim any broken or brown or dried leaves. 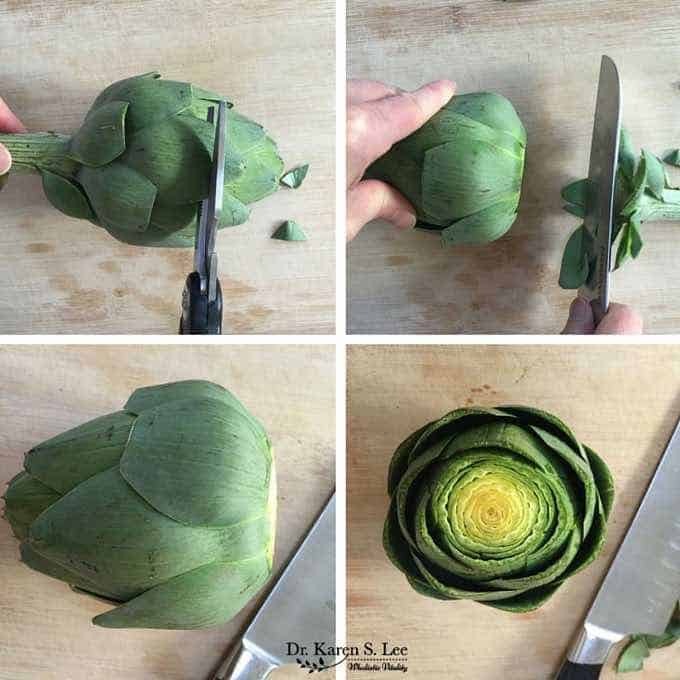 Cut across the bottom of the artichoke so it can sit inside the pot without falling. Then, after making your stuffing, separate the leaves apart and stuff the leaves with a small spoon. I usually place them in a large pot with a thick bottom with EVOO and water. Close the lid and let it steam for about an hour or so. But with oil splattering everywhere, not to mention burning the pot sometimes, it is a bit messy. So I have to watch over it while it’s on the stove. 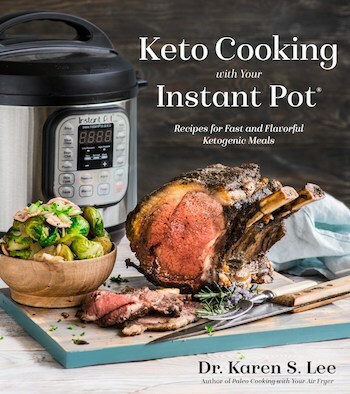 But with Instant Pot, not anymore. The pot doesn’t burn and I don’t have to watch over it. It still takes about 45 minutes after pressurized but I don’t have to watch it and the oil doesn’t splatter everywhere. Here is my paleo, vegan or vegetarian-friendly recipe you can tweak anyway you’d like. Pour one cup of water in the liner pot and place the trivet or a rack inside the pot. Place the butternut squash on the trivet. Set on HIGH pressure for 8 minutes and QR. 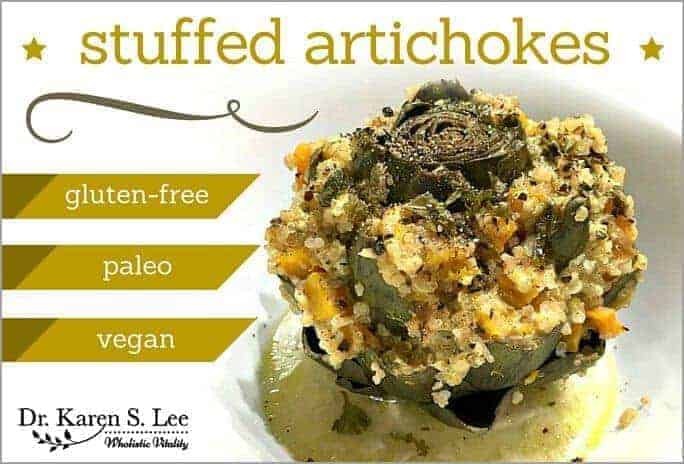 If the flesh is a bit hard, that's ok since you'll be cooking it again after it's stuffed in the artichoke. Dice the squash in small pieces and set aside in a medium size mixing bowl. Wash quinoa, pick out any debris and drain. Pour one cup of stock in the liner pot and add quinoa. The liquid level should be about the same as the top of the quinoa. Set at HIGH pressure for 1 minute. When the timer finishes, QR. Take out the quinoa and add it to the medium bowl with squash in it. Beat two eggs in a small bowl and add it to the squash and quinoa mixture. Separate each leaf of the artichoke and stuff with the squash/quinoa mixture. When all of them are stuffed set aside. Add 1 cup of water and 1 cup of EVOO to the liner pot. Place the artichokes in the pot as snugly as possible. If they don't all fit, divide them to steam later. Set on HIGH pressure for 40 minutes. Carefully take out the artichokes and place them on a platter and sprinkle with parmesan cheese if desired.